VN-Index, which tracks 256 companies and five mutual funds listed on the Ho Chi Minh Stock Exchange, rebounded on September 22. Liquidity severely fell to the lowest level since the beginning of this month as market lacked support from foreign investors. The benchmark edged up 0.13 percent, or 0.58 points, to finish at 453.9 points. Around 33.4 million shares worth VND908.2 billion changed hands, accounting for nearly 60 percent of trading volume the previous day. Of the index, there were 80 gainers, 105 losers, while 76 remained unchanged. Ocean Group Joint Stock Company (OGC) led the list of most active shares in volume for six consecutive days with 2.33 million shares changing hands. Vietnam Export Import Commercial Joint Stock Bank (EIB) continued to rank second with 1.18 million shares. Quoc Cuong Gia Lai Joint Stock Company (QCG) followed with 1.09 million shares. Construction Joint Stock Company No.5 (SC5) shot up 4.98 percent to VND48,500. Gia Lai Cane Sugar Thermoelectricity Joint Stock Company (SEC) advanced 4.96 percent to VND25,400. OPC Pharmaceutical Joint-Stock Company (OPC) ceased its three-day losing streak, climbing 4.9 percent to VND45,000. From September 20 to November 20, Viet Capital Securities Co., a major shareholder of OPC Pharmaceutical Joint-Stock Company (OPC), registered to sell 200,000 shares and buy 200,000 shares, sending its holdings to 581,581 shares, to restructure its investment category. Decliners on the city bourse included South Logistics Joint Stock Company (STG), Ben Tre Forestry and Aqua Product Import Export Joint Stock Company (FBT), and Lilama 10 Joint Stock Company (L10). From September 23 to November 23, Tran Van Nghia, member of the Board of Supervision of construction company Lilama 10 Joint Stock Company (L10), registered to sell 7,000 shares, cutting his holdings to 200 shares, accounting for 0.002 percent of the company’s chartered capital, for his family’s expenses. Meanwhile, the smaller bourse in the north moved contrastingly as the Hanoi’s HNX-Index slid 0.04 points, or 0.03 percent, to 131.53 points. 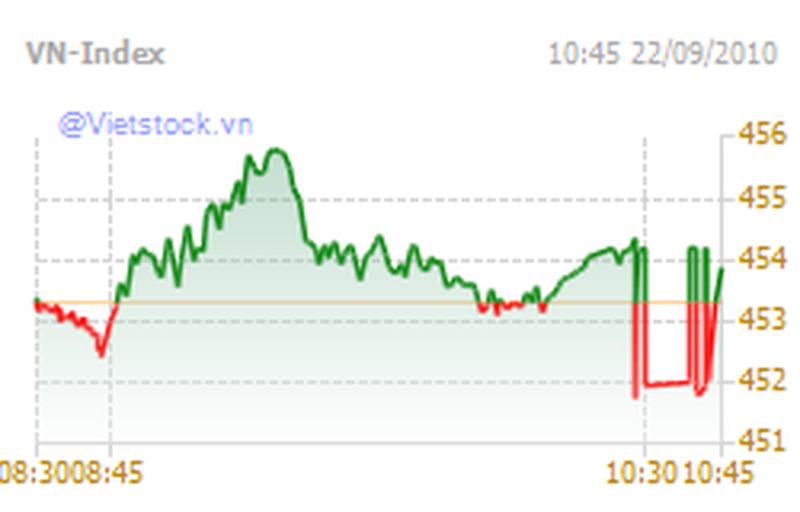 Trading volume sharply dropped over the previous session as just 26 million shares changed hands at VND655 billion. The UPCoM-Index dipped 0.98 points to 46.75 points. Around VND6.8 billion were spent on 0.33 million shares on the market of unlisted shares as of 11:15 am local time.